w7 have started to get famous, mainly due to their awesome Summer Collections which duped the Nails Inc Sprinkles for one fifth of the price :) They are an inexpensive brand - £2 in the UK - and the fact that they don't have any US distribution yet makes them more sought after. 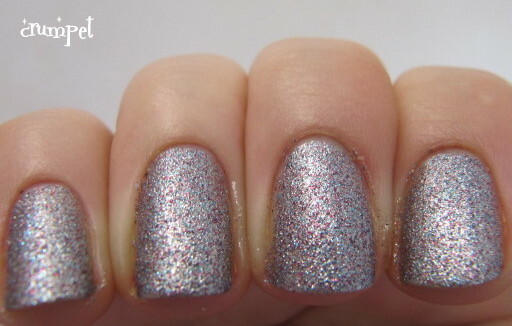 You've seen Mosaic, Salt n Pepper and Lava Flow before, well now here's another of their Summer wonderpolishes - Moondust. To be totally honest, I bought this on pure whim, it was an "ah, might as well" purchase, rather than a "gotta have" purchase. Moondust however delivers. I don't own anything else like it in my stash. 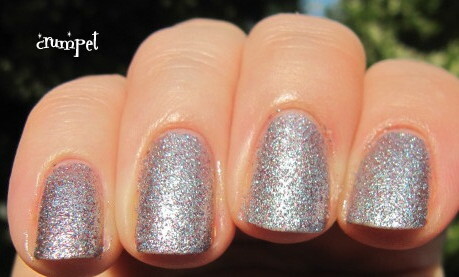 It's a super fine micro glitter that builds quickly and easily to opacity. It's main base is silver, but there are all sorts of miscellaneous tones in there, so that you're never quite sure what colour or colours you're seeing. I detect pink, blue, grey, but most of its beauty comes from its indefinability. This would make a great party polish - it definitely makes a statement - and there IS something of an alien quality to it too. If you're looking for something quirky and a little off track, this could be the one for you, but be warned, you're going to need foil for your removal!